Stocking stuffers is a phrase that makes me feel uncomfortable. When is "stuffing" ever good? I know when I'm "stuffed" it's a terrible feeling. I look around my home and often wonder if I own too much "stuff." So when I think of "stocking stuffers," all these idiosyncrasies come to mind. But, I'm conflicted because junkie gifts are always fun. 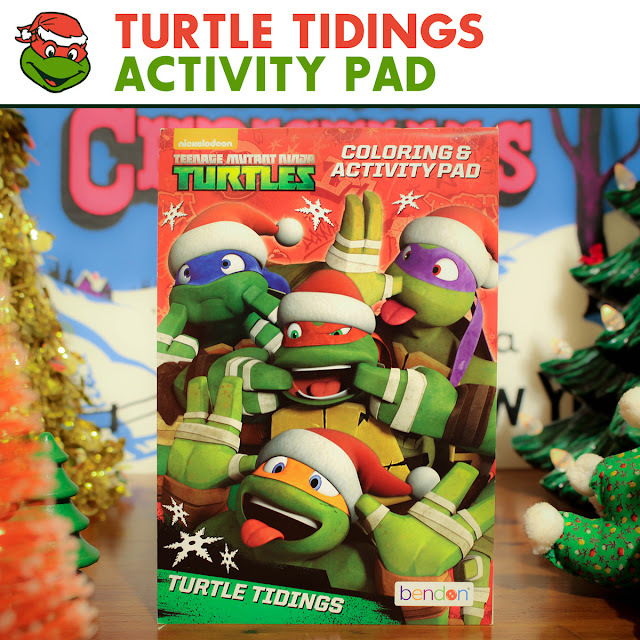 There are a few TMNT stocking stuffers that won't set the world on fire, but they are really festive. For a buck, the activity pad is a champion. The title alone, Turtle Tidings, is worth tossing bills at. The inside gets even better with never-ending Christmas imagery. Each page has unique art that is a tinsel and Turtle mutation. Why can't all TMNT holiday merchandise be this good? I mean, com'on, Michelangelo striking a Michael Jackson pose while wearing a Santa hat? That is one ninja move that cannot be topped. Just when I thought a mutated smooth criminal was the most festive dude in town, I flipped a few pages and landed on these irresistible bandana-wearing ornaments. I want to pluck these guys off the paper and hang them from my Christmas tree. They're cool, not overly cute, and non-Turtle specific. I could create my own pink bandana-wearing mutant and name him Larry. See the dreams this activity pad is capable of? If stocking stuffers keep being this great, my opinion of the term is likely to change. 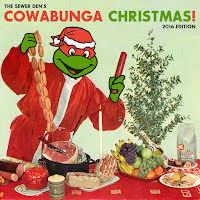 Bring on the $1 junk and stuff it in my stocking, especially when creativity meets cowabunga. You won't hear me complaining...I'll be too busy coloring in my activity pad. this colouring pad looks amazing i can feel your ecitement. i would have been too if i had it. thank you for letting us know now i am going to scout for it as well.